Guangzhou Yaoan Electronic Co.,Ltd is is a high-tech and innovative enterprise establish in 2004 located in Guangzhou, China. Which is a combined company with product research and development design, production, sales and service into one. l Trends consumption: ≤200 mA. l Low battery voltage warning. The voltage of PCB less than 4.8, red light flash and sound continuous to alarm need change new battery; the locks can open about 100 times in low voltage status. l Locking and unlocking record printable (with data collector machine). 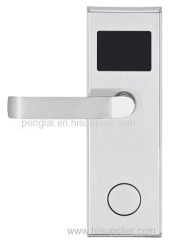 l Opening time: Turn on the handle to open door, after the door open, the lock will lock automatically. And if read the card but not open the door, the lock will locked again after 7 seconds automatically. l Emergency open door: Can open door in urgent status without limited, even the generous tongue indoor lock. l Requirement of door thickness: more than 38mm, if the door is laciness, which should be 110mm distance from the door side. l Material: Face panel: Stainless steel. Lock body outside: stainless steel, lock tongue and inside all metal material.